Today is a happy occasion on three counts. First, warmest congratulations on the opening of the Bank of Communications (UK) Limited. This is another key step taken by the Bank of Communications towards creating a comprehensive and global operation. Second, today sees a new member join the club of over 250 foreign banks in the City of London. This new entrant has a 103-year history and is a heavyweight player in China's banking industry. Third, China's banking sector is showing a strong commitment to London. 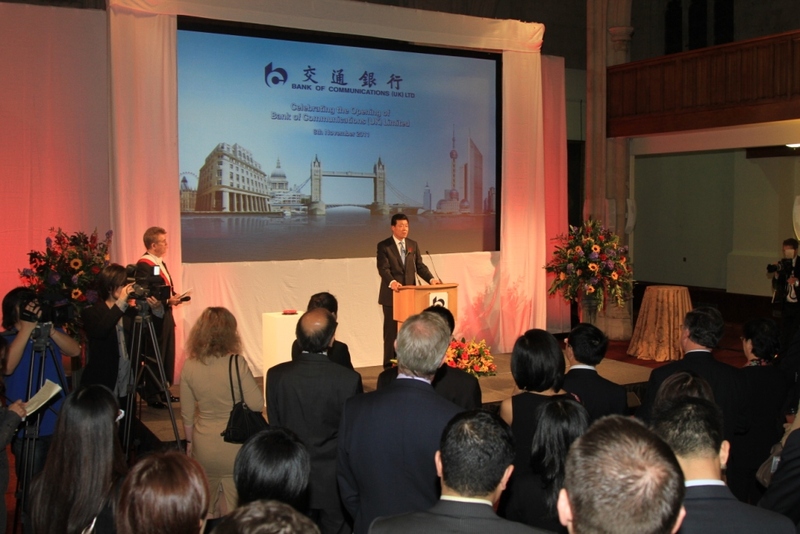 To date, Chinese commercial banks have opened one branch and four subsidiaries in Britain. I'm happy to learn that the Agricultural Bank of China will soon join their ranks. · and Bank of Communications. First, it chooses the right location. The City of London is the world's leading financial hub. Here are the largest forex, gold and insurance markets in the world. The Bank of Communications has a time-honored history and a reputation as the trail-blazer in China's financial reform. This is the hallmark of the bank's arrival in London. · It will make the bank more responsive to the international market. · It can raise its service standards for global clients. · It also plays an important role in training world-class professionals for the bank. Second, this launch in London comes at an auspicious time. Britain today is opening its arms to Chinese corporate investment. At the same time, under the guidance of the 12th Five-Year Plan, China is encouraging its companies to 'go global' and increase outward investment. Another driving force is that both our governments place a premium on financial cooperation. The latest example of this commitment was the opening of the UK-China Infrastructure Investment Conference in London this morning. All this adds up to excellent opportunities for the international development of Bank of Communications. Third, it echoes China's general growth trend. Following over 30 years of high growth, China is upgrading its growth model and further integrating with the world. Our banking sector should draw on the best financial management expertise worldwide. It is of great importance that Chinese bankers learn from the bitter lessons of the global financial crisis that is now in its third year. In a globalised world competition is a critical factor. To be more competitive globally, the Chinese banking sector must reach out and learn how to survive and thrive on global financial markets. Coming to London and expanding its global reach is a timely strategic move for the Bank of Communications. This launch in London will enable the bank to respond to the domestic and global economic and financial landscape. This will no doubt be the new source of vitality and growth for the bank. This going out into the world by Chinese banks and business can make a very positive contribution to global growth and prosperity. As the financial crisis around the world continues, it is vital that government and business leaders explain the benefits of open trade and markets. This is the only way back to growth and job creation. In closing, I'm confident that the Bank of Communications will do its bit to bring better 'communications' between China and the world!